One of the higher ranked players at this event, Amile Jefferson (#20 Scout, #36 Rivals, #24 ESPN) didn't have a very impressive performance, struggling to consistently score against a very well coached team in St. Mark's. 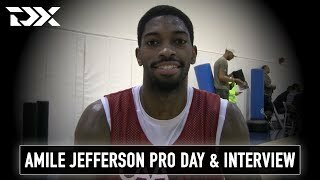 Measured at 6'9 at the Kevin Durant Nike Skills Academy with a 7-foot wingspan and a skinny 197 pound frame that looks limited in the amount of weight it can add in the short term, Jefferson is a very good athlete with a still developing skill set, while also being somewhat stuck between positions at this stage. On the offensive end, Jefferson appears most comfortable operating in the mid to high post range at this stage, where he can take advantage of a hybrid face-up/post-up game. Jefferson's ball-handling on face-up drives is fairly raw, but he's a bit farther along with his post moves, showing decent command of drop-steps and hook shots. Jefferson finishes well with touch around the basket, showing a nice array of running hooks and floaters to get the job done, but not showing much ability to score with power in the half court setting. On the perimeter, Jefferson's dribble-drive game is pretty raw, not showing the ability to consistently get past his man and showing little beyond basic straight line drives when he does. He didn't exhibit much in terms of a perimeter jumper in his game here, and hasn't in the previous two times we've written about him either. Defensively, Jefferson was mostly a non-factor, having to play the center position frequently on his team and struggling to match up with the much bigger and stronger Kaleb Tarczewski. He was very much a non-factor in help defense as well, not being much of a shot-blocking threat on the weakside. Projecting forward, he's probably most suited to defend either 3's or 4's, but it's not entirely clear which way he'll go, as there are questions about his ability to guard both. Looking forward, Jefferson still is a raw prospect with some intriguing tools, but has a lot of work to do in developing his skill-level and overall feel for the game. What position he's best suited to play both offensively and defensively is yet to be seen, but developing consistent ways to contribute offensively should be his highest priority at the moment.